Greywater System reclaims greywater from bathroom drains and reuses it in toilets. The Aqus system funnels water that flows down lavatory sinks and routes it through a sanitizing device that disinfects and filters the water. The water then goes to a storage reservoir under the sink. 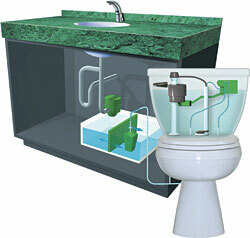 When a toilet that is connected to the system flushes, water is pumped from the reservoir to the flush tank.